One of my basement pipes decided to leak this spring. It happened in my craft room. This is the craft room that I had semi-organized. In my life that means I know some of what I have and more of what I don’t have. When the pipe leaked I had to dump everything into small containers and then into one big container to get them out-of-the-way. It was a big dumpfest. This week, after recently staying in a house with no clutter, I decided to tackle my basement clutter. It may have more to do with getting rid of an old buffet to make room for more clutter than decluttering. I have to move the clutter before we can see the buffet to move it to the curb. 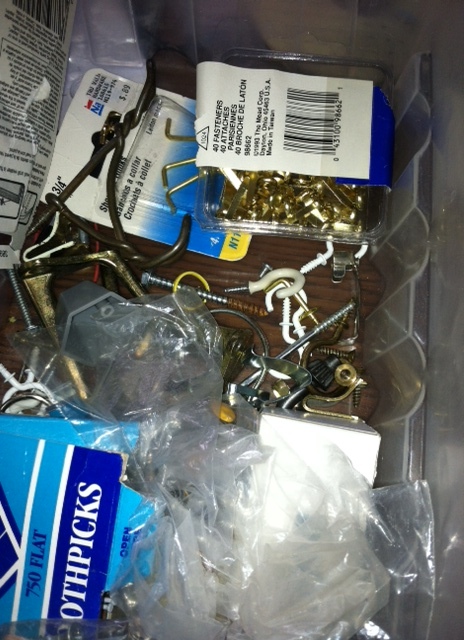 One of the boxes was full of hooks and doo dads. I looked at all the hooks in dismay. I had just purchased new hooks for hanging pictures. It was money I apparently didn’t have to spend. I had many hooks in this heap. I wondered how many hooks I needed. If I used all the miscellaneous hooks and nails etc. I would probably be very old. I threw some and then I sorted and put them in a case with see through windows. I will label the drawers. If I need a hook I will know where it is. My hardware store is going to miss my hook business. I did part with some, kept a few and let out a big whew! Now on to the broken jewelry mess. Next How Did I Accumulate All This Broken Junk Jewelry? I loved the skyhooks story. I think we should invent some skyhooks.